Inlays can be utilized to conservatively repair teeth that have large defective fillings or have been damaged by decay or trauma. 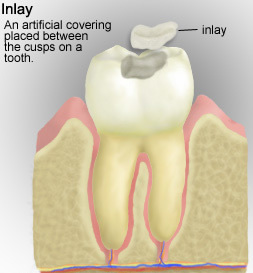 Inlays are an ideal alternative to conventional silver and composite fillings. Also, they are more conservative than crowns because less tooth structure is removed in the preparation of inlays. They are highly durable and will last many years, giving you a beautiful long lasting smile. An inlay procedure usually requires two appointments. Your first appointment will include taking several highly accurate digital scan impressions that will be used to create your custom inlay and a temporary restoration.